COUNTRYSIDE RAMBLING – AGAINST THE ODDS! 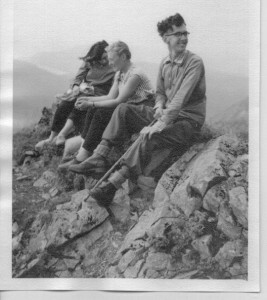 To understand the background to the Disabled Ramblers of today, I need to go back 60 years. I have nearly always been disabled, with a disorder which has developed very slowly over 65 years. At school I was unable to take part in sports, and in my teens I looked for alternative activities, mainly cycling and walking. I could ride 40 miles, or walk 10 miles in a day, and went away youth hostelling with my brother. On a cycle tour of Wales in 1953 I fell in love with Snowdonia and decided to climb a mountain. I only had cycling shoes but felt sure these would suffice – after all the peaks were only just over 3,000 feet high – surely a doddle to climb? Well, my innocence was shattered on the very first day, and I came down with my big toes badly skinned and very raw ! I wasn’t easily put off and next year bought very hefty boots which proved just right for the job. For the next six years I went up mountains every year, culminating with a climb involving Jo, who was by then my fiancé. (Last year we celebrated 50 years of marriage – how time flies!) This was in 1960. We attempted to climb Sgurr Dearg, one of the peaks in the Black Cuillin range on Skye, in Scotland. This range is fearsome and involves rock scrambling and steep climbing. We nearly reached the summit, but were defeated by a very exposed final 60 feet up to the top. We were aware of a very long almost vertical drop below and so we retreated! 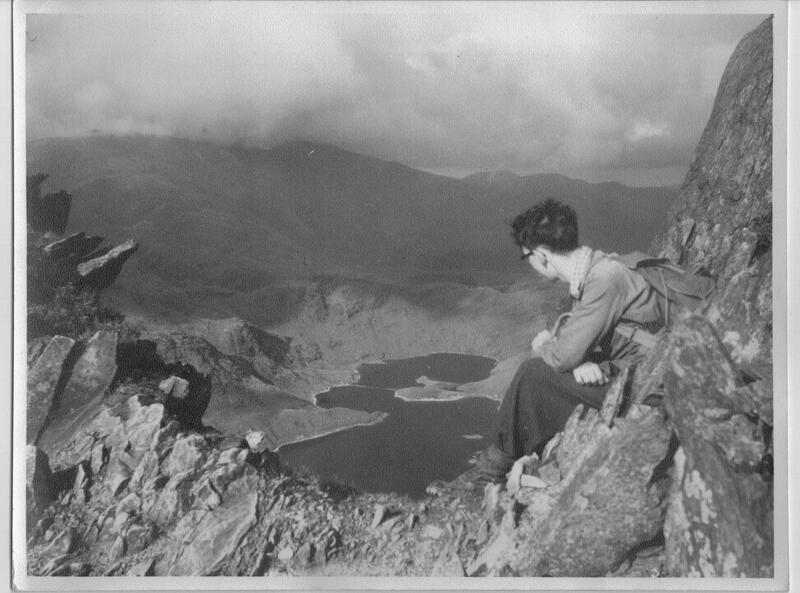 The Cuillin climb was my last – my strength was fading fast, and so I adopted a walking stick and went on much easier walks thereafter. 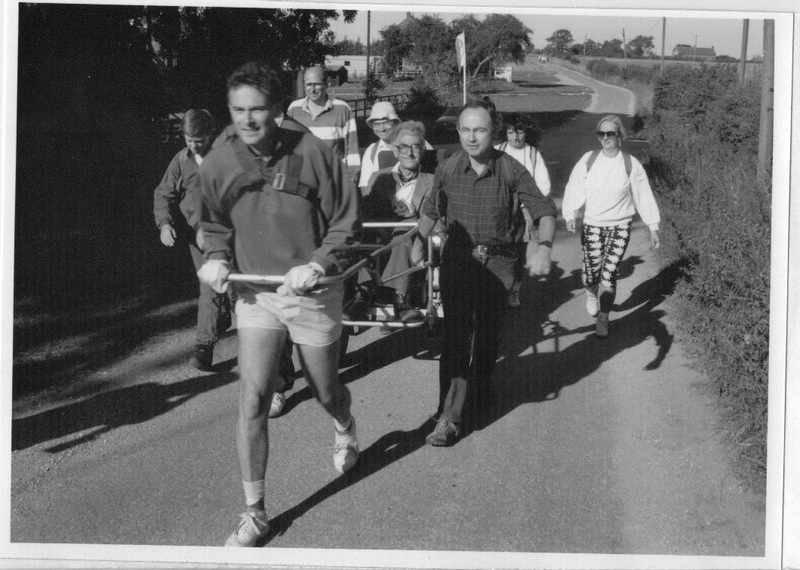 Now, fast forwarding thirty years to 1990, to a time when my walking was becoming very restricted. I was faced with a challenge to raise funds for my medical charity. The whole venture raised over £4000 and was immensely enjoyable. Shortly after this, I retired after 24 years service with BA, and took on a new job as Executive Director with the Disabled Drivers’ Association. This enabled me to develop a new hobby. I noticed the increasing availability of electric pavement scooters and I resolved to try these out in the countryside in places like the Ridgeway Trail, to see if any would be suitable for country rambling. 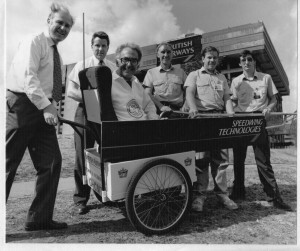 I quickly came across a wonderful man, David Wenman, who imported and sold robust scooters, called ‘Sportsters’. I bought one myself – it proved a revelation! So, in 1992 I organized the first disabled ramble for scooter and wheelchair users, again visiting the Ridgeway, but reducing the weekend distance travelled to just 40 miles. Around 10 riders took part, and they all did amazingly well, despite one day of heavy rain and thick mud. We all judged this event a great success but rather challenging! I next set up an affiliated group attached to the Disabled Drivers, called the Countryside Access Group, and over the next five years I organized an annual challenge ramble open to anyone interested. After three years on the Ridgeway, we moved to the New Forest, keeping the weekend 40 mile format unchanged. By around 1997 we were expanding fast. I reduced the 40 mile challenge format to just seven miles per day. This proved much more manageable and numbers of members soon grew to 100 then to around 200. We also visited new places and the number of days rambling per year went up to six, including Thames Valley rambles and Kielder forest inNorthumbria, as well as the New Forest. 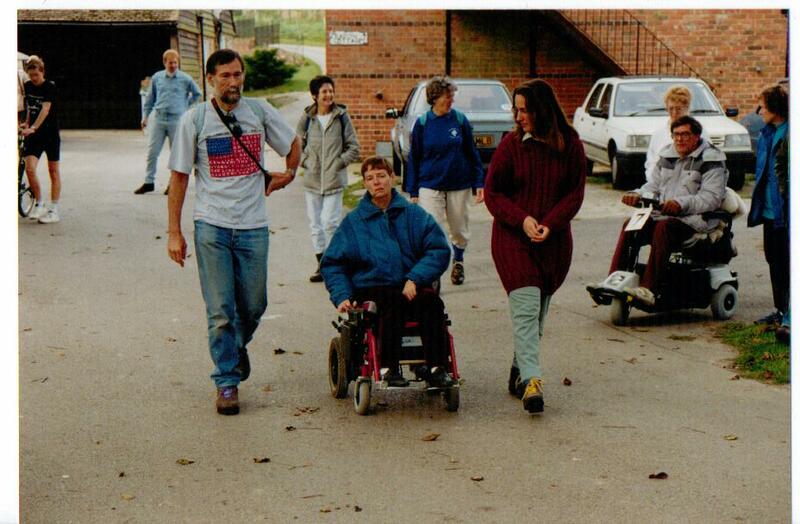 We soon established a powerful, hard working committee, including Robin Helby and Rosie Norris, and we moved to set ourselves up as an independent registered charity, the Disabled Ramblers. Robin Helby has always been imaginative and full of ideas. In 1998 four of us, Robin, Roger Fitzwater, John Hill and I set out on our first expedition. We decided to try a 62 mile section of the newly established Thames Path National Trail, between Oxford and Marlow. 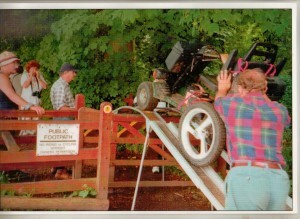 Robin took a leading role by commissioning equipment necessary to get us past stiles and ‘kissing gates’. 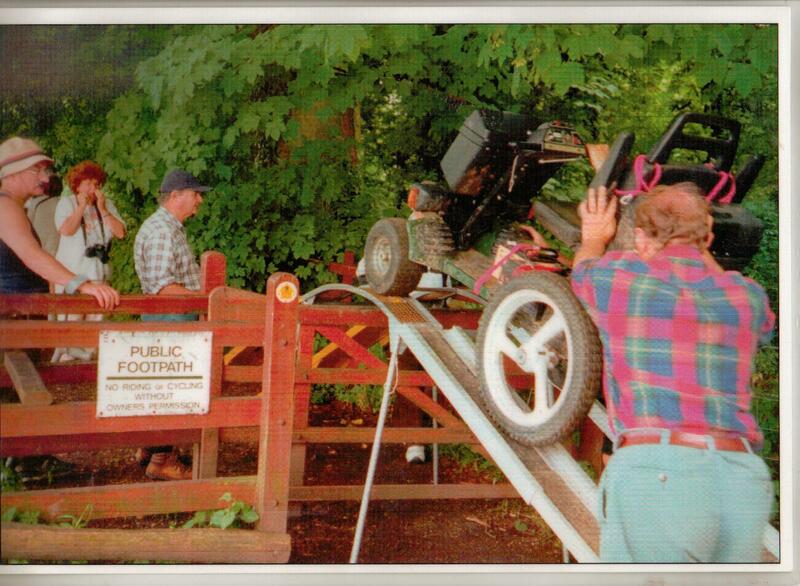 Starting with a bespoke lightweight trailer, Robin designed and had built a comprehensive bridge structure which could be quickly assembled and enabled our scooters and wheelchair to be helped over all the obstacles encountered en route. We had great fun and mercifully avoided falling into the river. Robin was almost without fear and I was more than happy to follow his wheel tracks over treacherous ground, where often the overgrown vegetation hid deep holes in the river bank! This expedition led directly to new developments. Firstly Robin and I modified our scooters to become prototypes of the new Tramper range, and secondly, we very much influenced the Countryside Commission to get involved with us in developing access standards to fit within more robust environments than had previously been considered as suitable for access by disabled people. Editor’s note: In this article, written in 2012,Mike has laid out for us the background to the present Disabled Ramblers’ organization up to about the millennium year 2000. This early period showed the development of our present pattern of rambling based upon heavy duty electric mobility scooters serving our desire to go to places without relying on specially developed and manicured paths. Mike also showed how we became involved with statutory bodies like the Countryside Agency (now renamed Natural England) helping to set out guidelines and standards of access suitable for our present and future needs. 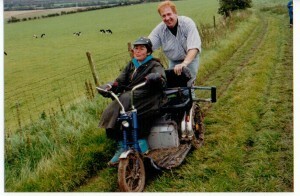 Mike was awarded the MBE for services to disabled visitors to the Countryside in 2005. He retired from the Chairman’s job in 2008. Sadly his wife, Jo, died on 15th September 2012. Mike died on 24th May 2017. Please see the Obituaries page under ‘Members Only’ for more about Mike’s life. Good afternoon, my name is Peter, I am very new ownership of a mobility scooter. I suffer from severe arthritis in both my hips and also Chronic Obstructive Pulmonary Disease. For a couple of years my mobilty, through pain in my legs and breathlessness was very limited and prior to getting my current scooter for the past year I’ve been virtually housebound. My little scooter a TGA Sonnet, although basic and limited has been a Godsend to me. It is my legs and lungs lol. At present I’m looking to sell the Sonet and upgrade to something a tad more versatile, I’m hoping to get the TGA Supersport. My query, as such, is I’d love to get involved in your Disabled Ramblers Club and was wondering how I go about joining? My mobility without the use of a scooter is drastically limited, but I wondered if I were disabled enough? My apologies if this sounds like a naive question. Any information you could pass on to me would be hugely appreciated.. Many thanks for your time….Peter L…. It is great to hear from you. My disablilities are similar so I thought I would add a comment. As a veteran of some 7 years I can say the main limit to joining us is that can you transfer from your car to a scooter by yourself. 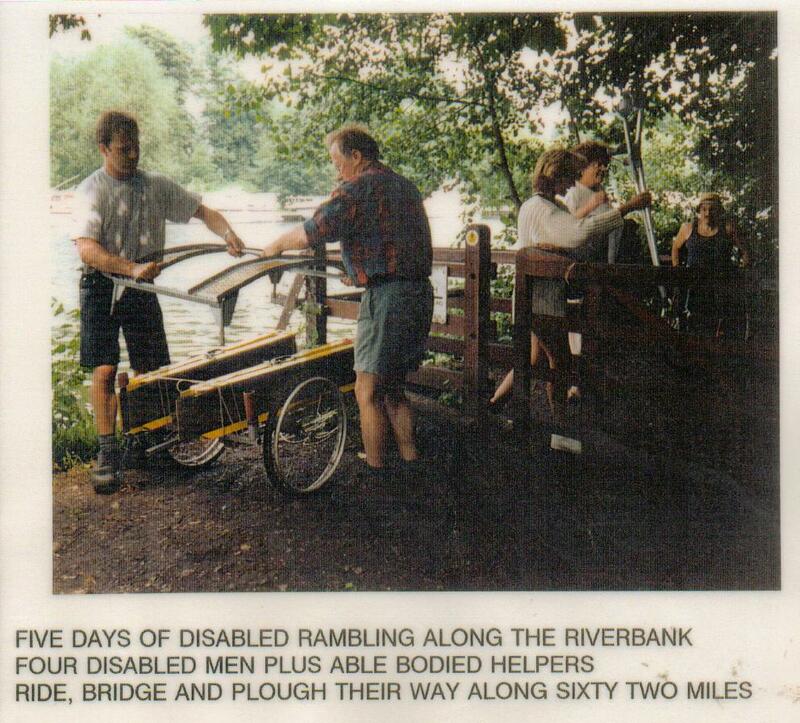 As Disabled Ramblers is largely run by disabled people we cannot guarentee help. We rely heavily on walkers to assist with gates, loading and unloading of loan scooters and helping those of us who are having a bad day. You are welcome to have a taster before you join – if you bring your own scooter you may need to try a catergory 1 – cat 2 if you can climb small kerbs with it. I am not familiar with that model. Walkers are very welcome so if you have someone that can come with you on your first ramble that would be a bonus. As I said if you can transfer by yourself have a look at the programme and book a ramble. We do ask you make your first a cat 2 if you are new to rambling on a scooter all the rain we have had can make routes more difficult than when first checked. Some walkers have been ‘sharing a scooter’ on longer routes – so most abilities welcome. Look forward to meeting you. 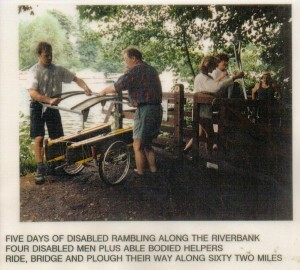 I hope Disabled Ramblers will write up their experiences in magazines or in booklets. I hope so too but at the moment we seem to be too busy finding rambles to record them!! Thanks for the info on the booklets. I’ve put a link to them in our Links page. Without the hard work of these pioneers, I would never have been able to access glorious parts of the British countryside. I’ve had such happy days, made new friends, been in awe of the courage and determination of other members and explored wonderful new areas which I just would not have known about or dared to travel to alone. I am sure the new generation of Disabled Ramblers will follow the lead of these pioneers and keep pushing back the boundaries. Without Mike’s pioneering spirit, Robin’s ideas & technical knowledge, plus Rosie’s determination there would be no Disabled Ramblers. I hope there are more people of this calibre to take our activities into the future.